"If only I could see you turn myself to me..."
I was awake before seven a.m., but...I was in bed by 11:30 p.m. This whole getting up early thing is weird, after years of being so nocturnal, but it might not be a bad thing. Just weird. Yesterday, I wrote 1,029 words on the noir and found THE END. I still don't have a title, which is one thing I have to do today. And proofread it. I sent it to Sonya yesterday afternoon, and she likes it. I hope the editor does. I also need to talk with Ted Naifeh today about an upcoming project and get serious about the proofreading for Tachyon. But I also need a break, after finishing that story. I want to go to Atlanta, and I want to go to Athens. There are things and places and people I need to see again. I need a lot more energy than I have. Here's a question I was asked on Facebook. I'll answer it here: I have a small question for you, if you wouldn’t mind. In VanderMeer’s Wonderbook, it says you perfect each paragraph and each scene. How do you do that without getting writer’s block? Do you have your plot already in mind? Yes, that's how I've always worked. Like most every other writer, I get blocked at times. I've never felt like my process makes me any more susceptible to it than the process of any other writer. As for the plot, sometimes yes, but most times no. As many know, I'm not nearly as concerned with plot as I am with characterization and mood and language. Often, plot bores me. That said, I tend to allow it to unfold as I write a story. One event leads naturally to another. One scene is the consequence of all the scenes before it, not (usually) something I have worked out ahead of time. 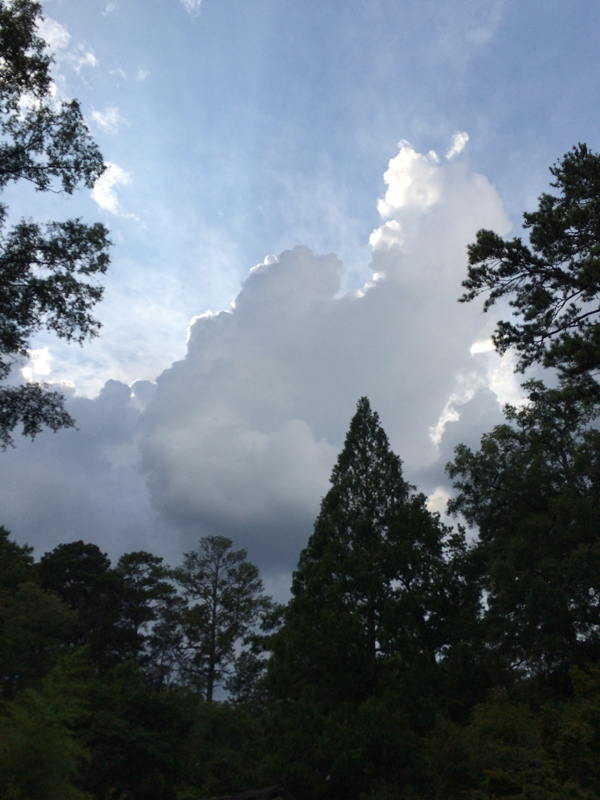 We had a good walk at the Botanical Gardens yesterday, but a storm was brewing, and we had to cut it short. Still, we saw a swarm of baby toads, each small enough to fit on a dime, and the turtles and the koi and cavorting chipmunks. Afterwards, leaving Piggly Wiggly, we were caught in the downpour. It was a glorious rain. Last night, we watched John Ford's magnificent The Searchers (1956), likely the greatest of all John Wayne's accomplishments and one of my favorite westerns. Please have a look at the current eBay auctions. Thank you. The Searchers has been on my mind a lot lately, I might need to watch it again soon, too. Great photo. I love all the wildlife photos you're getting now. I was curious as to if you were familiar with the work of Renée Vivien. Snuggly Books issued a new translation of some of her work recently (a slim volume entitled "Lilith's Legacy: Prose Poems and Short Stories"), and as I've been reading it I've been wondering if maybe it would be something you'd dig. The biographical blurb at the very start of the book makes her sound like someone straight out of a Baudelaire poem (a neurotic, anorexic, alcoholic, suicidal lesbian doomed to self-destruction), and her somewhat death-obsessed Symbolist-inspired prose is quite in line with the Decadents. I just bring this up become some of her themes and obsessions remind me of your own work a little: doomed romances, mythological references (mainly Greek), a fixation on the ocean... some of the story titles give a clue as to what to expect: "Lilith," "To the Perverse Ophelia," "The Song of the Sirens," "The She-Wolf Lady," and so forth. Thank you for cross-posting the quotes from Facebook, especially the Robbe-Grillet. It is brilliant, and I adore the concept of transitory sense. Although I know myself well enough to foresee I may return to it eventually, I believe my (FB) account may be past the point of no return deletion by now. I cannot help but find it interesting to learn about people's creative processes. Thank you for sharing a glimpse into your own.